After occasionally bumping into tour guide Marie Hallier at various functions in Bordeaux and featuring an article she had written about the colour of the Garonne river on the blog, Marie suggested we team up, along with Bordeaux Expats’ Mike Foster, for a day travelling along the right bank of the Gironde estuary. Having recently returned from a cycling tour of that area, I was keen to go back and take in some of the sights I may have missed the first time round. Along with Mike, we were also very much looking forward to spending some quality time in the company of a renowned guide whose territory stretches from Bordeaux to the Médoc and the Bassin d’Arcachon, and who has become especially regarded as an authority on the north bank of the Gironde estuary and the wine-growing (and brandy production) area around Cognac. And so it was that we joined forces at our designated meeting spot near an exit of the A10 motorway, and hopped into Marie’s people-carrier heading for our first stop, Saint-Georges-de-Didonne, just to the south of Royan. Together we admired Phare de Villières lighthouse and the stone memorial to the Operation Frankton commando raid on Bordeaux (a recurring theme on the blog of late) before driving south to the other side of the “Conche de Saint-Georges”, in other words the bay where the town of Saint-Georges has developed, and on to the Pointe de Suzac, the very spot where the Gironde estuary and the Atlantic ocean merge… although that merger is very much tangible: Marie pointed out the line in the waters where the Gironde’s distinctive brown turns to sea blue! So this is where the estuary ends and the ocean begins. But the treasures of the strategically-located Pointe de Suzac extended far beyond the spectacular view: we first ventured into the open remains of a Napoleonic-era guard house and gunpowder magazine before exploring a whole battery of bunkers which were a component of the extensive Atlantikwall means of monitoring and protecting the coastline during Germany’s occupation of the area during the Second World War. The then heavily-protected zone (surrounded by minefields), which became the so-called “poche de Royan” of German resistance post-Liberation, was bombed by off-shore Allied forces in 1945. The Germans stationed here finally surrendered on April 15th 1945. The Napoleonic guard house and gunpowder magazine. From then on the area was first abandoned before being turned into a children’s playground and then a motocross track! In more recent years the local council has gradually turned it into a peaceful rambler's paradise, with its hiking trails and viewpoints. Of course, the Atlantikwall bunkers won’t be going anywhere in a hurry, and we peeked inside a number of them, trying to imagine what life must have been like for the German troops here back in the day. 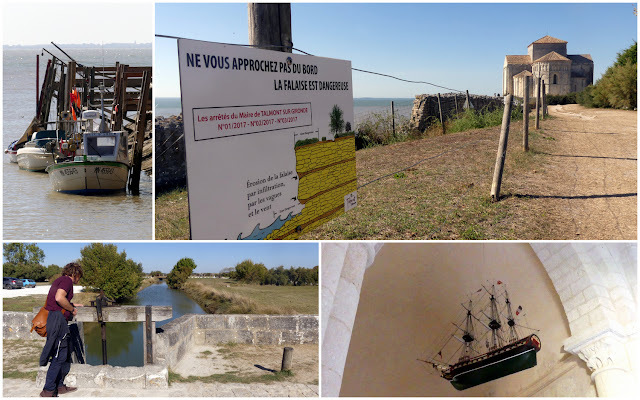 Marie’s next plan was to make our way to the scenic village of Talmont-sur-Gironde, via the small resort and marina of Meschers and past the wild bay comprising what Googlemaps labels successively as Banc de Dau et Banc du Bœuf. The ecosystem there is evolving as the area becomes more and more heavily silted over time. 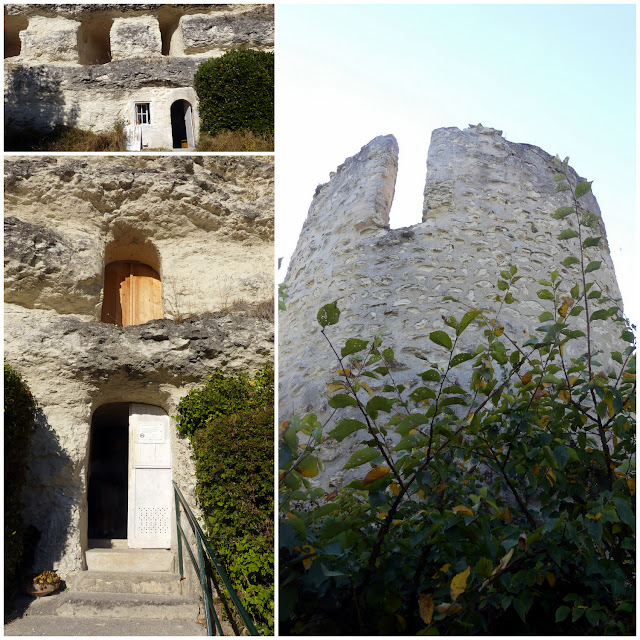 As Talmont had been a stop on my recent cycling tour, again I was looking forward to hearing Marie’s take on some of the more unusual aspects of the village. She didn’t disappoint, sharing tales of the routines of Talmont’s sole remaining fisherman, revealing abandoned plans made first by the Americans to transform the village into a massive military port, and then by the French to convert it into an oil terminal, showing what remains of a lane which separated the Catholic and Protestant graveyards, and explaining the story and symbolism behind the “ex-voto” model boat which hangs from the ceiling in Sainte-Radegonde church. She even gave background information as to why Sainte Radegonde was such an emblematic figure in Charente-Maritime. Other subjects which were raised were the effects of erosion, the canal lock system, recycled cannonballs, disappearing sundials, how a carrelet fishing hut raised money for charity, and the special relationship between Talmont and handcrafted weather vanes. Needless to say, Mike and I were impressed! Clockwise from top left: the only fisherman in the village's boat, warnings of erosion, the ex-voto suspended boat, and Mike inspecting the canal lock system. Back in the people-carrier we were now headed towards Mortagne-sur-Gironde but stopped en route to take in one of Marie’s favourite views over the estuary, at a spot where we were also able to observe the effects of “poldérisation” (the reclaiming of land): after low-lying agricultural land became flooded in 1999, the decision was made to let nature take its course once again, and the resulting marshland is now home to a wealth of fauna and flora. Arriving in Mortagne-sur-Gironde, we headed to the heights of the port town, to take in another cracking view over the estuary and to inspect an unusual hand-shaped monument celebrating the achievements of the Welsh prince and soldier Owain Lawgoch (Owain of the Red Hand), who fought for the French against the English in the Hundred Years’ War, notably during the siege of Mortagne castle. 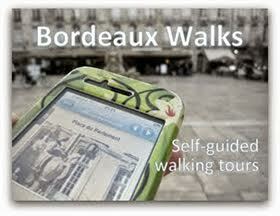 The story arguably merits its own Invisible Bordeaux investigation sometime in the future! But the best was yet to come, as we made our way down to estuary level to visit the rather unique Saint-Martial hermitage. There we and other visitors were greeted by two enthusiastic volunteer tour guides, Patricia and François, who proceeded to theatrically walk us through the site, which began as a hermitage in medieval times, became a monastery in the 18th century and then a shepherd’s haven, before opening to visitors passing through from the early 1900s onwards. And, unusually, the various rooms are either natural caves or were hand-carved out of the cliff-face. The visit started out with the steep 25-metre climb to the circular bell tower perched at the top of the cliff, reached via a tall, narrow stone staircase. Then it was on to the prayer room and the “salle d’eau” (fed in the past by freshwater springs which have since dried up, although another one has recently been discovered). Throughout, Patricia and François exuded plenty of excess energy which was part contagious and part mystifying, although they took things to a whole new level when we reached the small but very impressive chapel. As we entered, we were promised a “son et lumière” show, the first chapter of which was Jeff Buckley’s version of Hallelujah being played through a Bluetooth speaker hidden behind the solid stone altar. Patricia tried to get everyone to join in on the choruses, making for a bit of an uncomfortable, half-hearted sing-song with complete strangers. Then, after François had noisily slammed the door shut in full-on escape game mode, we were treated to various combinations of pulley-operated open and closed slats, demonstrating how the original creators of the chapel played with direct and indirect sunlight. There was much scripted talk of acoustics, statues and stone (often the two clearly lovestruck guides speaking in perfect unison), and the whole experience was as interesting as it was at times surreal. Mike and I were slightly shell-shocked as we got back into Marie’s people-carrier, but we also realized that we had been given an insider’s glimpse into one of the most surprising sights in the whole region. We felt strangely lucky, privileged even, and were now homeward bound, driving back to where we had met up a few hours earlier. Even the commuting had proved to be an engaging experience: between the various stops there had been much fascinating conversation about Marie’s life as a tour guide, working with travel agencies, tourism offices, cruise ships and private groups, the ever-escalating importance of social media, the relatively unregulated tour guide marketplace in Bordeaux and the unlevel playing field of having to compete with unlicenced cash-in-hand counterparts, and many more subjects besides! After we had said our goodbyes, Mike and I reflected on the undeniable added value of having a bona fide guide to lead the way. Marie’s mission was truly accomplished and she can now proudly add the unofficial “Approved by Invisible Bordeaux and Bordeaux Expats” label to her enviable list of qualifications! 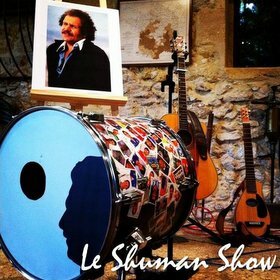 > Marie Hallier’s various tours are detailed on her website, www.bordeauxcognactourguide.com, and she can also be found on Facebook and Twitter. 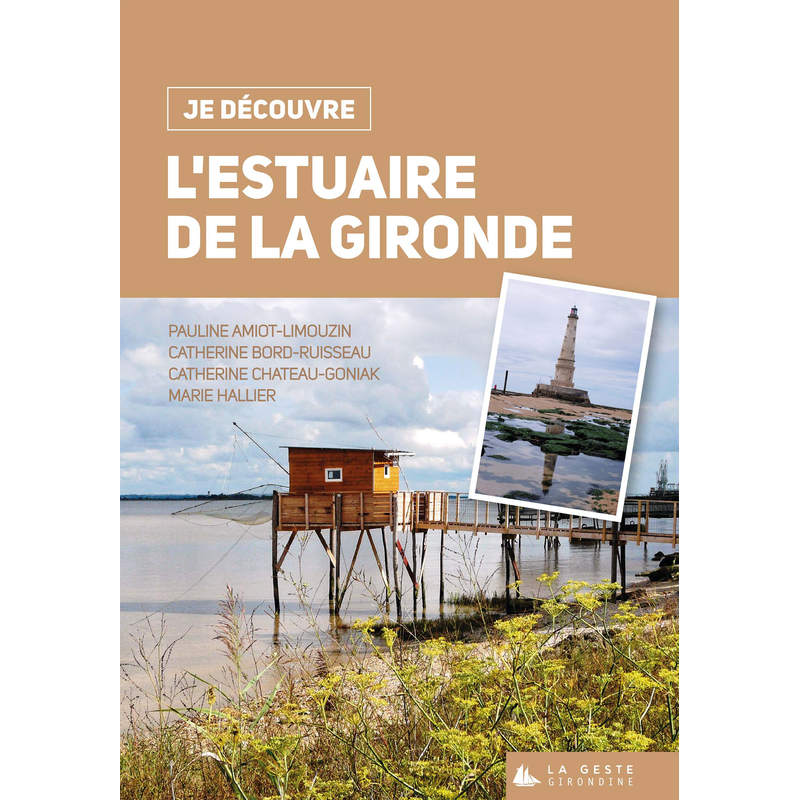 > Marie Hallier has also co-authored an excellent guide to the estuary, “Je découvre l’estuaire de la Gironde”, published by La Geste Girondine (pictured here). > Photography was not allowed inside the chapel of Saint-Martial hermitage, but a few pictures can be seen online here. As you may have gathered, Bordeaux is making regular appearances in easyJet Traveller, the in-flight magazine available on board all easyJet aircraft as they criss-cross Europe in all directions. 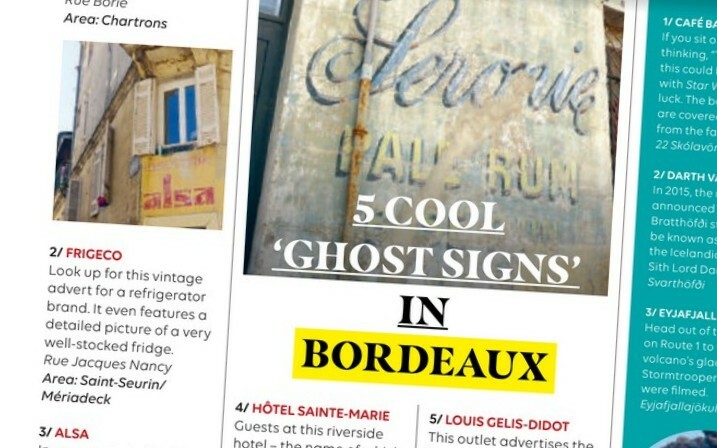 Throughout October 2018, the subject is so-called ghost signs, faded handpainted signs and advertisements that have somehow managed to survive the test of time... and one of the recurring themes on the Invisible Bordeaux blog over the years! Five of the city's prettiest signs feature in this "listicle", which is a pleasing case of old-school communications and design finding their way into the hands of modern-day travellers!